Hamilton Beach Professional Deep Fryer Just $16.88! Down From $25! Right now you can get this Hamilton Beach Professional Deep Fryer for just $16.88 (Reg. $25.88) at Walmart! You can also get it on Amazon for $25. Plus shipping is FREE on orders over $50 0r you may be able to get FREE in-store pickup! HP Venetian Women’s Tote Just $11.99! Down From $50! Right now you can get this HP Venetian Women’s Tote for just $11.99 (Reg. $50) at Walmart! Combining practicality and style, this HP 15.6″ Venetian Tote looks great and protects your essentials to help you through your busy day. The perfect complement to an always-connected life, it’ll keep all your devices secure and keep you looking sharp as you take on the world. Totino’s Party Pizza’s Just $0.50 At Walmart! Women’s Weekender Bags Just $9.50 At Walmart! How cute are these weekender bags? They are on right now for just $9.50! Down from $18.88! Be sure to choose FREE in-store pick up so you can get FREE shipping to your local store, too! Or you can gte FREE shipping to your door on orders of $50 or more. The No Boundaries Women’s Canvas Printed Weekender Tote Handbag will be your go-to bag for weekend getaways. Constructed of durable canvas with some elegant faux leather trim, this handbag has a cute all-over printed pattern that’ll pair well with your favorite outfits. There are two handy outside pockets for the items you need to access quickly, while the roomy main compartment is secured with a hassle-free zipper. Inside, there are two inside cell pockets and an inside zip pocket to help organize your things. Two faux leather sling handles and an adjustable shoulder strap keep the canvas tote manageable. It’s available in assorted styles. Hamilton Beach 12-Cup Programmable Coffeemaker Just $19 At Walmart! Down From $40! Wow! What a nice deal! Right now you can get this Hamilton Beach 12-Cup Programmable Coffeemaker in black for just $19 at Walmart! Down from $40! Be sure to chose in store pickup for FREE shipping, too! Amazon has it for $32.04. Help yourself to cafe-quality coffee every morning. Whether you’re brewing coffee for two or making enough coffee for family and friends, the Hamilton Beach 12-Cup Programmable Coffee Maker is the perfect size and offers many features to fit your brewing needs including three brew strength options, a programmable timer and a two-hour automatic shutoff. This full-size coffeemaker looks great on the counter with a stainless steel design that fits right in with any kitchen. This coffeemaker has a pause and serve feature so you can pour a cup anytime during the brewing process. Removing the carafe automatically pauses the drip so you can get your first cup before the pot is fully brewed. Would you like to wake up to the aroma of fresh coffee every morning? Programming is very simple with the large buttons and display and can be done up to 24 hours in advance, which is great for anyone on the go. No hand washing is needed, both the carafe and filter basket are top-rack dishwasher safe. FREE Dulcolax PLUS Overage At Walmart! You can get FREE Dulcolax at Walmart PLUS overage! FREE Stock Up Alert! FREE U By Kotex At Walmart! PLUS Nice Overage! Right now you can get FREE U By Kotex products PLUS OVERAGE! The Lightdays Liners are $0.94 at my store and the coupon is $2 off ANY U By Kotex products! The Barely There Liners are $1.24, so again FREE plus nice overage! Final: FREE PLUS $1.06 OVERAGE! Final: FREE PLUS $0.76 OVERAGE! FREE 2-in-1 VO5 Dandruff Shampoo And Conditioner PLUS Overage At Walmart! You can get FREE V05 2-in-1 Shampoo AND Conditioner PLUS $0.25 OVERAGE at Walmart! 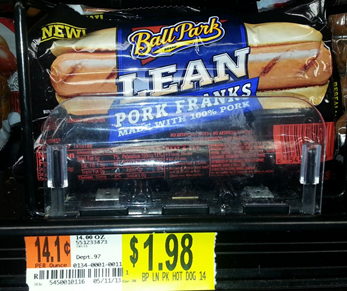 You can get Ball Park Lean Franks for just $.98 at Walmart! At Walmart they are $1.98. There’s a new Dole Pineapple printable coupon out and it’s even better than the one we’ve been getting! Great time to stock up for your summer cooking! We love to grill burger out and put a slice of pineapple on top of the burger and then melt a piece of cheese on top! It’s really good, try it some time if you haven’t had it before! 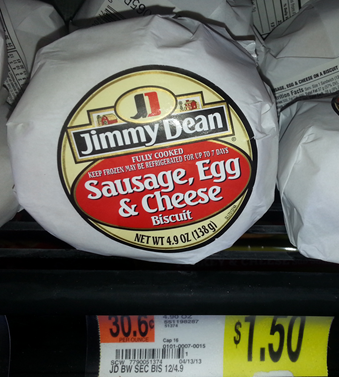 They look filling and Jimmy Dean products are usually pretty good. Right now you can get them for just $.95 at Walmart with this new coupon. 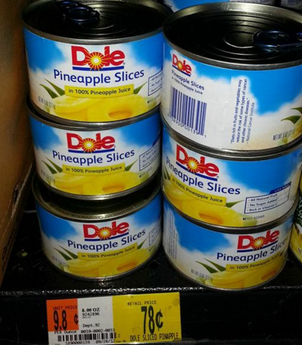 Dole Canned Pineapple $.60 Walmart Deal! Grab some Dole Canned Pineapple for $.60 At Walmart! 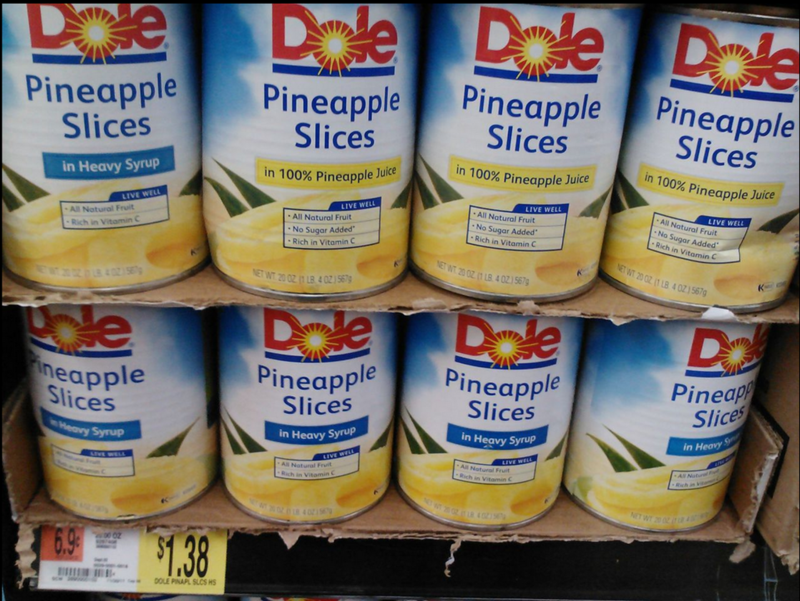 There are two Dole Pineapple printable coupons out. 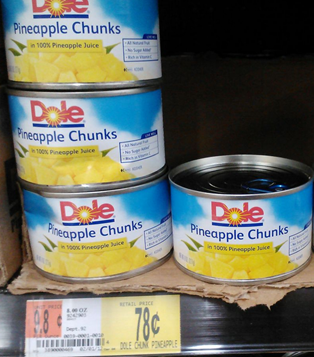 Walmart sells the 8oz cans of Pineapple Chunks for $.78. 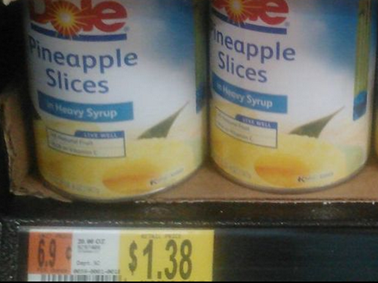 Walmart also has the 20 oz Pineapple slices for $1.38. 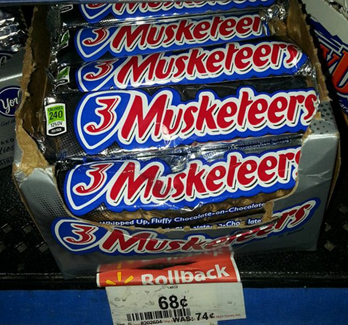 Dove & 3 Musketeers $.34 Walmart Deal! 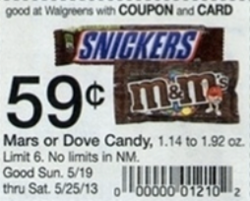 You can get $.34 candy bars at Walmart beginning tomorrow, 5/19/13! Walmart takes competitor coupons when they have a specific price on them.